​Email us if you would like to come visit or for more information. 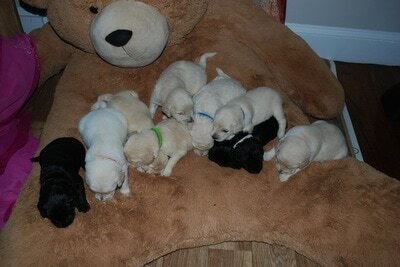 Puppies will be placed with families based on the best match between the family and the puppy. Who adopts our puppies is extremely important to us, we have the right to decline the adoption of one of our puppies if we feel it is not a right fit. Be advised that we will only contact you by e-mail or phone call when our dog is has more puppies than deposits received. If we don't get a response by e-mail by the 3rd day, you will be dropped from the waiting list. They will leave for their forever home with up to date shots, microchipped, 2 year genetic guarantee, a binder of information, big folder of all records and microchip registration, and a blanket & toys that smell like their litter mates and parents. We do reunions for the puppies to see their littermates and parents every summer.